Sitting at dinner the first night at Henry's Fork Lodge, there was smoke in the air. Investigation on the internet indicated the fire was 100 miles away near Arco, ID. I thought there must be tremendous winds aloft to carry the smoke to where we were. The weather was for the most part wonderful for fly fishing. We were a week later than we usually come so missed the best fishing (green drake's on the surface) on the Henry's Fork, but no matter there were so many places to fish one just points a finger and away we went. We fished five days never hitting the same water twice. 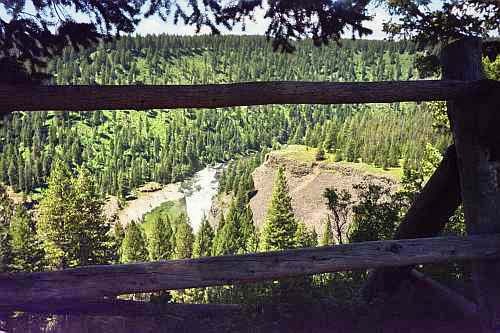 The first day was the south fork of the Snake; Wolf to Byington. The simplest put-in, just backed the trailer to the river's edge and push and a modern concrete marvel courtesy of Idaho's Dept of Fish&Wildlife take-out. 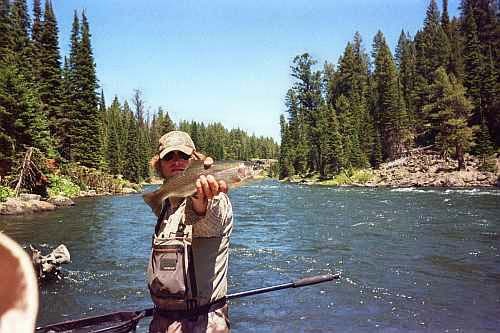 Our guide, Dan Kappes, put us onto cutthroat's, german browns and rainbows. Fishing riffles mostly as it was blowing pretty good in the afternoon. Still getting 10-15 fish in each riffle made for an interesting day. We fished foam bodied dries with a nymph dropper most of the day. Our guide told us that there was a moratorium on rainbows as the state of Idaho wanted to preserve the Western Cutthroat and that rainbows were inter- breeding with the Cuts, producing a hybrid, so there was a reward for rainbows. As a 'catch & release' fisherman for years it was difficult to kill fish; but in the interest of science I killed 2 rainbows I caught that day, opened them up to check their stomachs and found loads of 'zebra duns'. that became the nymph of the day. (Worst luck I left the camera in the car). The second day we fished the famous "Box Canyon" on the Henry's Fork. The section is only about three miles long, but it drops 1500 ft in that short space of time. You can imagine that there is lots of fast water, so our guide, his name was 'Hootie', (he said he was a Georgia "Bulldog", walked the boat down the river the whole 3 miles. He held the boat while battling the swirling waters and irregular bottom; we in turn were able to cast to either side of the boat. Small wet flies (12-16)with trailing nymphs or midges, (18 - 22). We landed lots of fish,but we lost quite a few too. The wind came out of the west and straight upriver in the afternoon; I ended up taking several flies in my thumb and the back of my hand. They went in so fast and came back out that way too, hardly any blood. The "Box" is known for big fish and lots of them; browns, rainbows, and whitefish. Our guide was named "Hootie" and he was a Georgia 'Bulldog'. He was a strong young man and very knowledgeable though he had only been guiding for a couple of years. The third day it was back to the south fork of the Snake (it fished the best while we were there), fishing from "Twin" put-in to "Lorenzo" take-out, (not as nice as Byington, but still better than "Wolf". The only difference was that the rainbows were missing from our catches. I saw no rainbows the whole day, but lots of cats and hybrids and of course a few of those indiginous "whitefish' Our guide for the remainder of our trip was Tom Grimes, aka 'Tall Tom', all of 6'10". 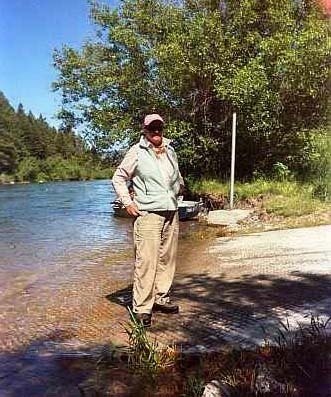 A wonderful guide, we've had him before on several of our trips to fish that part of Idaho. 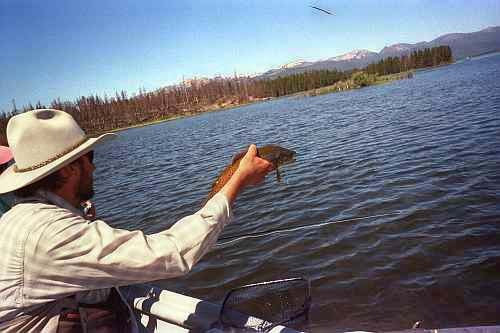 The 4th day found us at Hebgen Lake, an impoundment of water on the Madison River, northwest of West Yellowstone, MT, so we needed a one day fishing license for Montana; there to fish for 'gulping trout'. The south arm of the lake only averages about 8 feet deep. Using 'callebaetis' dries with 'Prince' nymph droppers we were casting either to the right of 'swirling' fish. The object was to out think the feeding fish. The fish would swirl the water's surface eating bugs and your had to determine where it was going to rise again and put your flies right in his path, hopefully having it take the bait. It was best to have a small ripple on the water so that the fish wouldn't see you while casting. Trying to be stealth means you stay seated (don't rock the boat). We learned quickly and did hook a couple of nice fish. 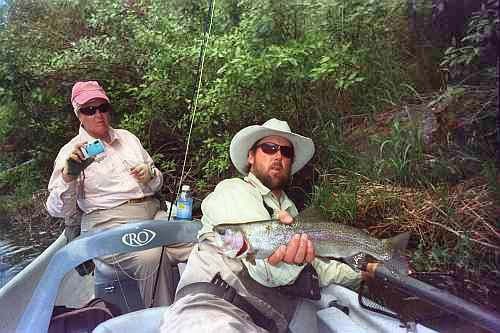 I caught a nice rainbow, while Bobbie landed a nice german brown. Finally around 12 the wind came up and ended our new experience. We trailered the boat and headed for the Madison River (Lyons Bridge to Windy Point) to complete our day in Montana. The "Madison River" is a world renowned stream, hence a well fished piece of water. It has been said that as many as 100 boats have launched from Lyons Bridge put-in in a single day. When we arrived there were but 2 boats ready to launch. Ours and someone else; who once on the river we never saw again. With so many boats these fish are experienced; wary; but still hungry. Casting hopper imitations with 'Prince Nymph' or "Zebra Duns' as droppers, we had a successful afternoon of fishing, but I as glad to get off the water when we did as the wind was starting to rise, coming right up river making rowing and casting difficult and in some cases almost impossible.